Ever Think A Jaw-Dropping Physique Is "Impossible" For You? Listen, transformation is not an event, it’s a process! The first step of that process is putting your trust into a coach (or coaches in our case) -- who cannot guarantee or promise any specific result (or else we would be just trying to sell you). 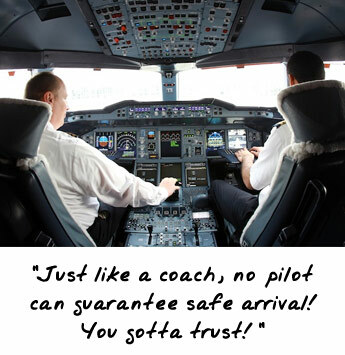 Putting your trust in a fitness coach is like putting your trust in an airplane pilot. You give the pilot/airline a certain amount of money to take you to your destination. You put your trust in them to get you there safely, on time and without too much turbulence! As much as you want to ask the pilot/airline to promise you safe arrival, the y can’t. The only security you have is by looking at the pilot's/airline's track record! At the end of the day, this is what matters! It doesn’t matter what you, another person, textbook or research article thinks/claims should happen as far as the outcome -- all that matters is what is happening, what was the outcome?! Value RESULTS above all else. You see, BPak and I could boast about the $60,000 we both spent on our 4-year Kinesiology Degrees from the University of Western Ontario (which teaches all the fancy science subjects like anatomy, human nutrition, physiology and biomechanics); or the 634 personal training clients we’ve trained in person; or the 10 years we’ve invested surrounding ourselves with the world’s brightest doctors, therapists and coaches; or we could remind you about the 100,000 guys and gals from 123 different countries who’ve followed our online programs, articles and videos successfully; or the dozens of magazines we’ve been featured in; and we might also add that we’ve competed in 24 competitions against the world’s top bodybuilders and fitness models. But that would be just bragging, wouldn’t it? Too be frank though, we kind of are bragging NOT because we think we’re superior, but to show you that we KNOW what we’re doing and we’ve dedicated our lives to helping people like you overcome the “impossible”. Essentially, we’re in the business of doing the impossible! regular to ripped, skinny to Spartacus & average to astonishing! Young or old… male or female… ectomorph or endomorph… average genes or amazing genes… newbie lifter or pro bodybuilder… it makes no difference! We don’t care what set of obstacles life has dealt you… with BPak and Vinny D in your corner, we’re going to SMASH your genetics, incinerate the fat, pack on pounds of muscle and make your body DRIP with confidence so you can LOVE your body 365 days a year. Now, just in case you’re looking at us or some of these pictures and thinking,“I don’t want to get ‘too big’ or ‘too ripped,’' I hear ya! TRANSFORMATION IS NOT AN EVENT, IT'S A PROCESS! You are in COMPLETE CONTROL of how big or lean you become. Take it ONE DAY AT A TIME. You might achieve your dream body after 12 weeks, or it might take you 12 months. DECIDE to maintain that new body when you arrive. WARNING: the LONGER you work with us, the BIGGER and LEANER you WILL become - it’s inevitable. You’ve been warned. As you can see, we’ve been getting results for years, and our upcoming Hypertrophy M.A.X. Monthly Series is by far our most advanced, cutting-edge and intelligent program to date. Are you ready to work with two of the world's most premier muscle-building coaches, learn from the most effective muscle-building research and have it all organized into our best step-by-step system? Remember, we’re on a mission to HELP 1,000,000 people by the year 2020 and we’re trusting you’re going to help us make that happen! Update #2 - The Inspirational Story Behind The Birth Of Hypertrophy M.A.X.